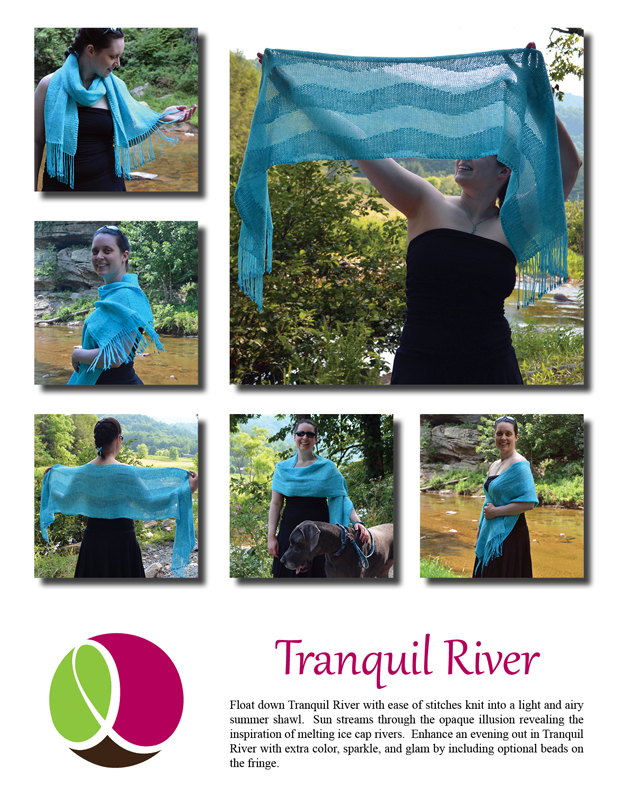 Float down Tranquil River with ease of stitches knit into a light and airy summer shawl. Sun streams through the opaque illusion revealing the inspiration of melting ice cap rivers. 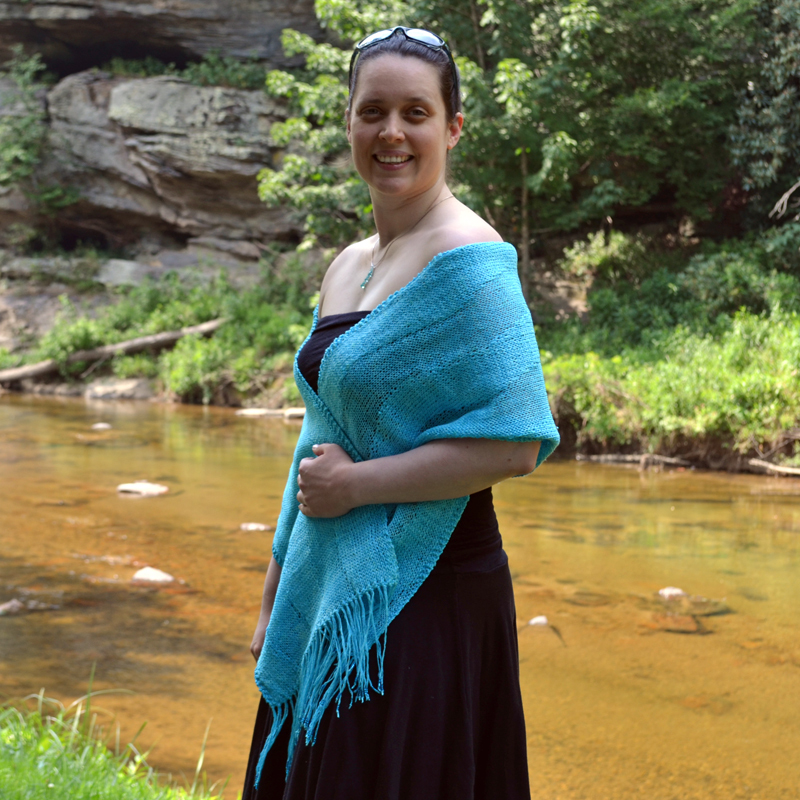 Enhance an evening out in Tranquil River with extra color, sparkle, and glam by including optional beads on the fringe. The tech edited and test knit pattern is fully written and charted. 72”/ 183cm long (with fringe) by 14.5”/ 37cm wide. Easy to customize! 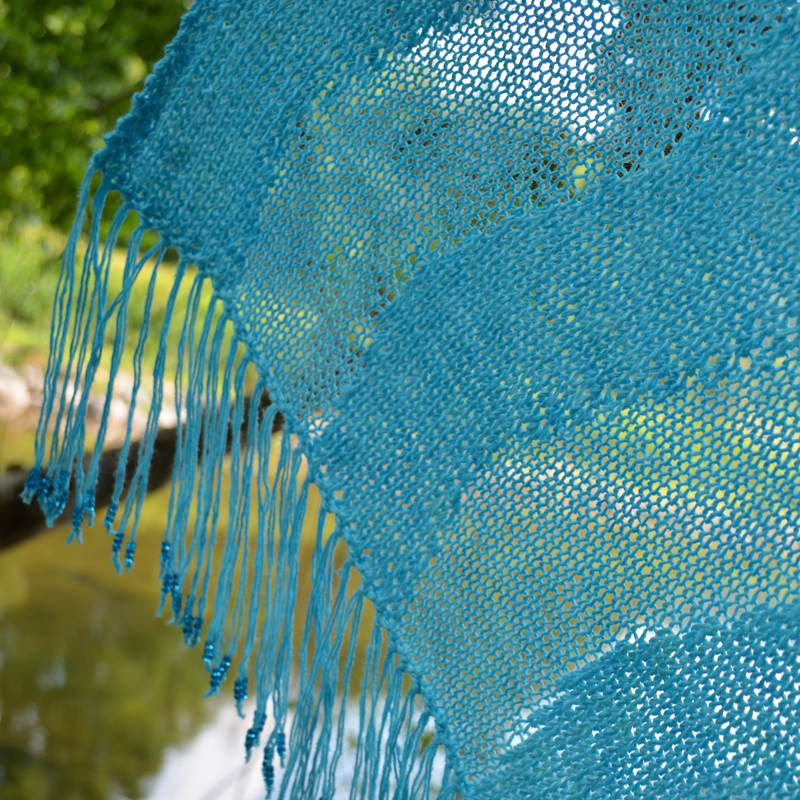 4 skeins Eco-Stitch Sport, shown in Azure. Optional: scissors, 432 glass beads & beading crochet hook – Japanese seed beads size 6/0 in Silver Lined Transparent Capri Round shown. 19 sts and 23 rows over 4”/ 10cm in pattern stitch. Note: exact gauge is not critical to this design. Gauge variations may impact final size and yardage requirements. Yarn conservative: break one skein into 3 mini-skeins for the 3 sections of double stranding. 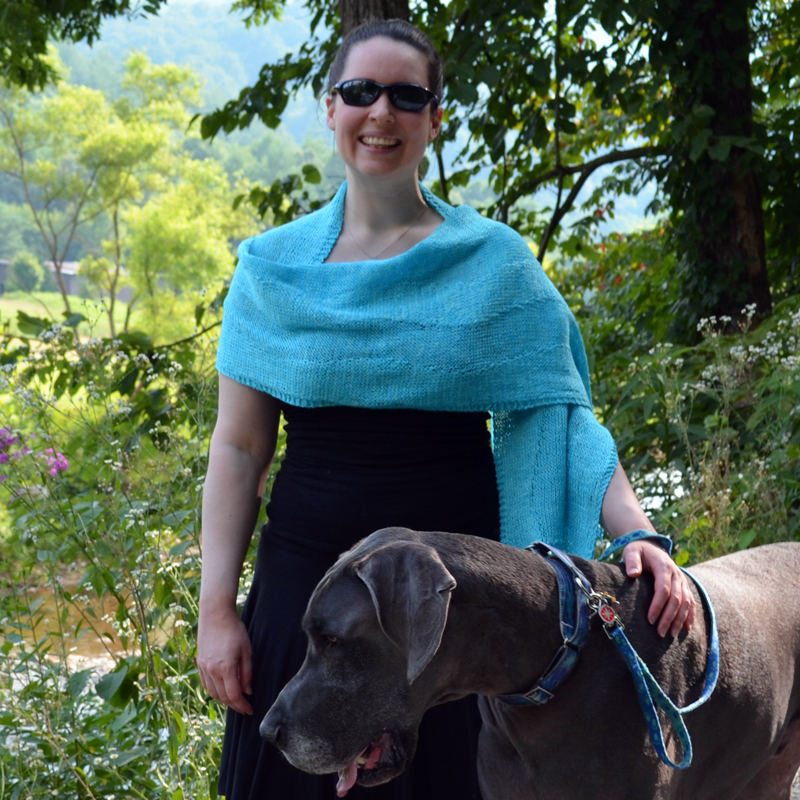 Use the remainder full skeins for both the single and double stranded sections. If you run short, break the final skein up as needed for completion. Yarn extravagant: if you don’t mind having a skein worth of leftovers, go for 5 skeins. Then use an individual skein for each of the double stranding sections. Use the fourth skein for both the single and double stranded sections. When you run out of the fourth skein add the fifth skein. Alternate between the remaining skeins, every couple of rows, for which is the skein used in both the single and double stranded sections. This method, worked correctly, results in no cutting and creating mini-skeins! • If substituting yarn, swatch stitches 12-36 on chart to see how the illusion looks in your selected yarn. You may wish to go up a needle size or two from the ball band recommendation for an increased airy appeal. The sample is knit a couple needle sizes larger than is typical of sport weight yarn.